To link existing products you'll need to be logged in to both your WrodPress site and your Inkthreadable account. We're going to work through linking existing WooCommerce products here, but if you need to create new products you'll want to jump to this guide instead. Before you get started, if you'll be using DTG neck labels you'll need to upload these to your Brand page before linking your products. You can find out how to do this here. If you're ready to get started then head to your WooCommerce page and click the Manage WooCommerce Products link. You'll see a list of each of your WooCommerce products and the Inkthreadable product they're linked to, if any. The Robot Jersey Unisex T-Shirt was created in Inkthreadable and imported to WooCommerce, so it's 100% linked, but the Skull Cropped Jersey T-Shirt wasn't. This was an existing product in WooCommerce before integration so it's not yet linked. To link this existing product, click the Edit button. On the next page, you'll need to assign the product you'd like to use for fulfilment. Click the Link button and select the product from the drop down menu. In this example, we're linking with Continental Clothing's N28. The N28 option has been selected, and the next step is to link variations of this product to variations of the WooCommerce product. When you check the box next to any variation details are auto-populated; it's very unlikely these will be right, so these details will need changing. 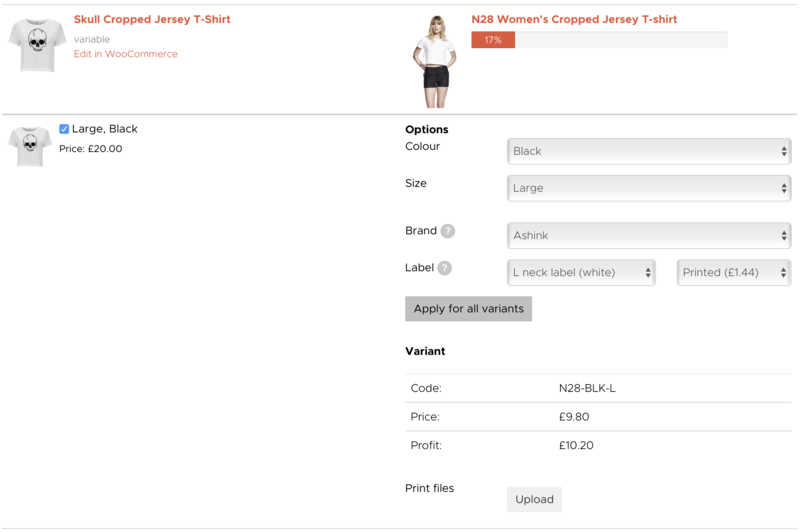 In this example both the colour and size needed amending to match the WooCommerce variant size and colour. There are two optional extras you can set up here too: a DTG printed neck label and a custom print file. If you'd like neck labels printing, you'll have needed to upload these to your Brand before going any further, but if not you can leave this set to 'none'. 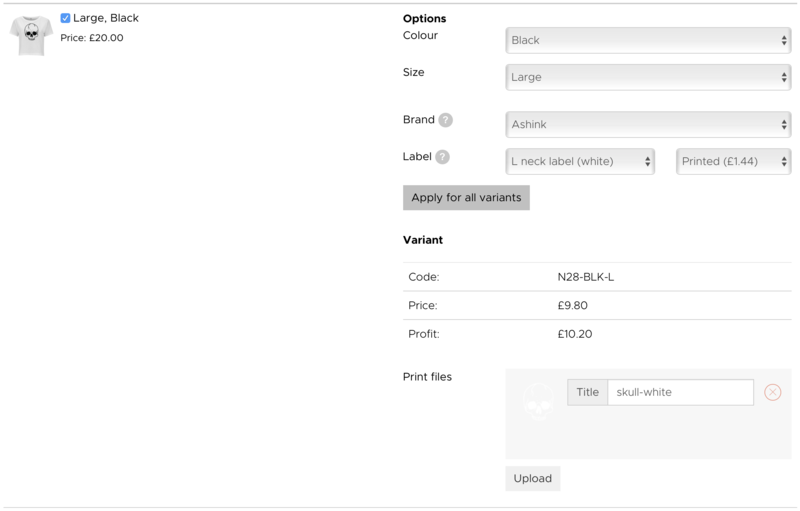 Any labels you've uploaded will be available as an option from this drop down menu, and adding one to the garment will add £1.51 to the cost of production. There is an option to upload a print file to be applied to each variant at the bottom of the page, but you have the option to assign print files individually in the case that one or more of your variants will require a different print file. In this example, there are two colour variants: black and white. The print file for either will not be suitable for the other, so we need to add a print file suitable for the black variants. Move down the list of variants, checking the box for any you'd like to link and assigning the right options based on size and colour as you go. Take care to complete these accurately since any mistakes made will cause mistakes when the product is fulfilled. At the bottom of this page are two final requirements: uploading a product mock and print file to assign to each product variant. The product mock tells us where to print, and the print file gives us the means to do it. If you've assigned print files individually as you've gone along you won't need to do this. If this product has only one colour variant then the same print file can be used for them all, and uploading this print file here will assign it to any variants that don't already have one assigned. Click Save and you'll be returned to your list of linked products. The green bar next to each represents the percentage of variants that have been linked. If yours is full, like ours is, you should be good to go. But if not and you haven't missed any variants intentionally then you'll need to click Edit again to see what was missed.